uPVC French doors are amongst the most attractive exterior doors available. Constructed from internally reinforced uPVC for maximum protection against cold and wet weather, our French doors combine style and practicality like no other. Give your garden the entrance it deserves with uPVC French doors. Based on the appealing design of uPVC French casement windows, these double-glazed doors offer maximum ventilation yet take up minimal space. A combination of traditional design and twenty-first-century engineering. Immaculate Home Improvements offer uPVC French doors with a seamless finish, giving the impression of one solid shape door. The quality of our uPVC French doors ensures they will never rot, crack or fade. Our uPVC French doors are finished with huge panes of thermally focused double glazing, letting in maximum natural light during hot summers days and preventing cold air ingress during winter months. 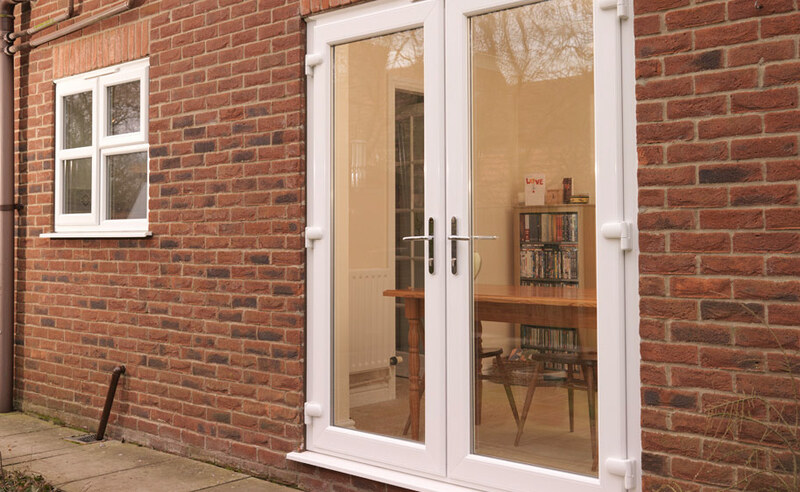 For ease of access, our uPVC French doors are available in a low threshold option. For homeowners looking for wide uninterrupted views of the outside world but lack the space needed for either patio or bi-fold doors, uPVC French doors are the perfect choice. Enjoy sweeping, panoramic views from our stylish uPVC French doors. Immaculate Home Improvements are dedicated to fitting home improvement products that boast high levels of security throughout their long life. To achieve this, we fit high grade stainless steel multi-point locking systems to our French doors. Our French doors have been developed using reinforced multi-chambered uPVC profile. 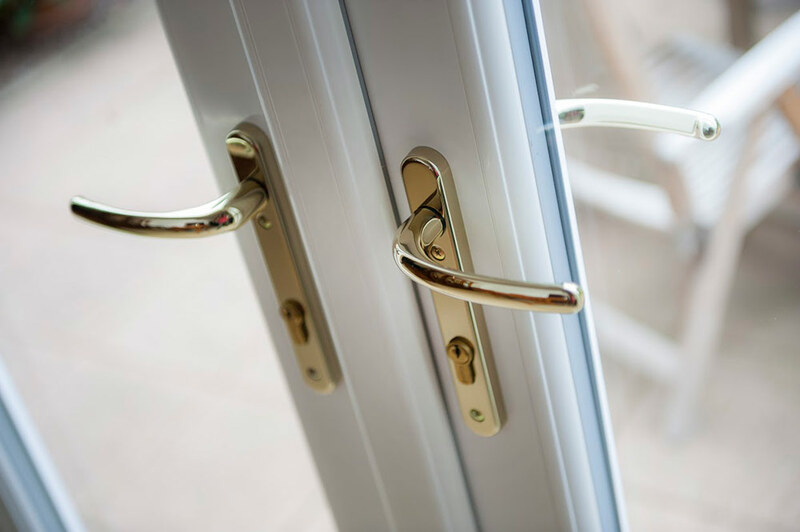 All our locks are fitted to the inside of the frame, ensuring they are complete protection. Immaculate Home Improvements are proud of the fact our uPVC French doors are Secured by Design accredited. Police approved security for your Bournemouth home. For homeowners looking for an attractive double glazed back door which works to minimise your carbon footprint and give you lower, more affordable energy bills, uPVC French doors are perfect. These stylish doors are manufactured using multi chambered uPVC and thermally focused glass, targeting cold air ingress to give you lower energy bills. Immaculate Home Improvements offer our supply and fit service for uPVC French doors in Southbourne, Bournemouth, Christchurch, New Forest, Sandbanks, Poole, Lymington, Boscombe, Wimborne, Corfe Mullen and nearby Dorset towns. We use intelligent quotation software to offer our customers instant online uPVC French door prices. Get your free online quote for uPVC French doors today in just two minutes. For further information on our uPVC French door service, please send us an email via our contact form or give us a call on 01202 427700. We are happy to answer any questions you may have. Start Your Free Online Quote! Get your free, no obligation quote today using our easy to use quoting engine! Why Choose A Sternfenster Approved Installer? All our products are carefully manufactured with a great deal of love and care by trained professionals right here in the UK. By choosing to work with Sternfenster, you directly support the British manufacturing industry. Choose quality. Choose British. Immaculate Home Improvements offer a huge variety of attractive RAL colour finishes. Ensuring your double-glazing complements the aesthetics of your property. Sternfenster have a state of the art painting facility at their large, purpose built factory. Choose the perfect premium paint finish for your Bournemouth home. Sternfenster operate from an ultra-modern, cutting edge factory. The company is respected throughout the industry for their consistency, both in turnover speed and quality of product produced. Each member of staff is subjected to thorough training, becoming experts in their field. Sternfenster are determined to be the fabricator of the future. Throughout our trusted resellers websites, you’ll find lots of entertaining and engaging content. Enjoy videos, online brochures and quality images complete with details of all our available products. We are proud to be recognised for our high standard of excellence by Sternfenster. The perfect profile fitted by experienced double glazing installers. The Sternfenster frame-assembling team carefully inspect all our uPVC frames, ensuring each one meets our high standards. The perfect frame each time. Quality, hand finished windows and doors. Designed to decrease expensive monthly energy bills and battle noise pollution in your Bournemouth home. Give your home the finish it deserves thanks to an exciting range of uPVC windows. Choose from Deceuninck, Residence 9, and Styleline Windows.